Snap 'n Grip multi purpose wrench system is universal wrenches for all nuts and bolts. Efficient, practical and easy to use. Automatically fits to the size and shape of nuts and bolts. This is a multipurpose tool that helps in tackling multiple sized wrenches on your own. The product comprises of a set of two different wrenches that suits all nuts and bolts ranging from 9mm to 32mm. The practical tool adjusts itself according to the size of the bolds and with all systems of measurement. 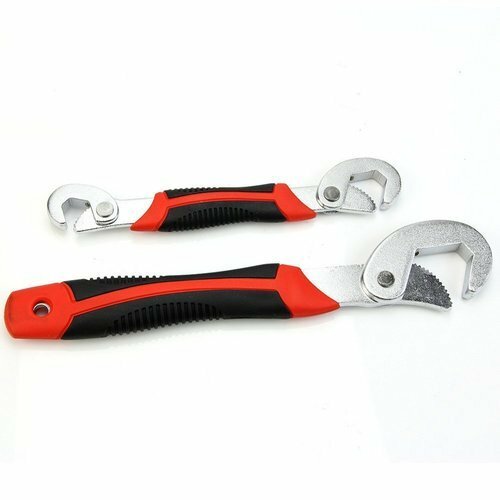 The set of two wrench comprises of one small and one large wrench. Small wrench has a different-sized head on each end, while the large wrench has a single large head for bigger nuts and bolts. However, both can be used for al the different purposes irrespective of their size and shape, as these wrenches adapt themselves according to its usage. You can use snap n grip wrenches for tackling daily problems with taps, valves, pipes, lines, radiators, boilers, wheels, etc. We Traders 5253 from 2014 are a popular organization in the industry for wholesale trading a wide range of . Micro Fiber Hand Gloves, Barbecue Grill, Kitchen Slicer, Egg Boiler and much more. Extensively valued for their long service life, lightweight, and perfect finish, our provided products are highly commended.